Hearing aids are small, therefore the batteries that power them are small. If you have limited vision or poor dexterity (such as arthritis in your fingers), you may find changing the small batteries a challenge. Rechargeable batteries will give you a full day of charge when you charge them overnight. Depending on the type of rechargeable battery you get, will vary how long you need to charge your hearing aid (read more on this below). It’s a bit like charging your phone – pop it on the charger before you go to bed and you’ll have a full power charge when you wake up in the morning. 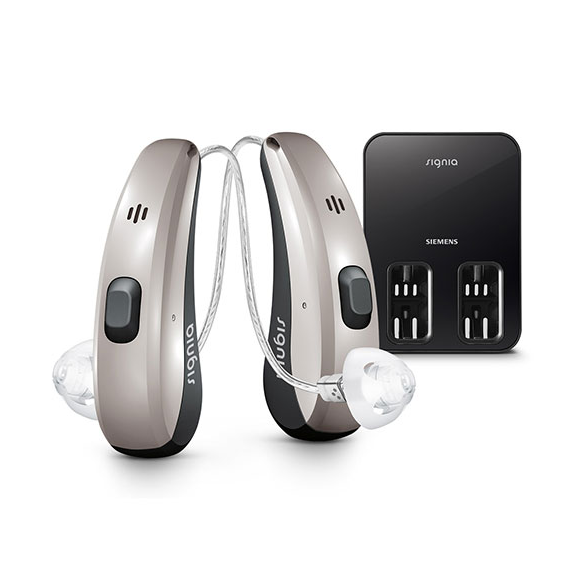 With a rechargeable hearing aid, you’ll have an easier device to use with less stress. You won’t have to remember to take disposable batteries with you just in case your batteries die while you’re out. Your rechargeable battery lasts a long time and, for some types, lasts the life of the hearing aid. This type of rechargeable battery has been made popular by the company Z Power, and can be retro-fitted to existing hearing aid brands. These batteries look like the disposable batteries you may be used to for your hearing aids. This is good because if you do happen to run out of power you can slip in a disposable battery to keep your hearing aid going until you can get to a charger. A number of manufacturers offer silver zinc (known as Z Power) rechargeable options – Unitron, Starkey, ReSound, Oticon. One of the best things about Silver Zinc rechargeable batteries is that they are 100% recyclable so once the battery has run its life (usually a year) take it back to your Hearing Healthcare Provider and they will change your battery and get the old one sent off for recycling. These batteries are also non-toxic and non-flammable, but if your dog swallows a battery still get him checked out by your vet. 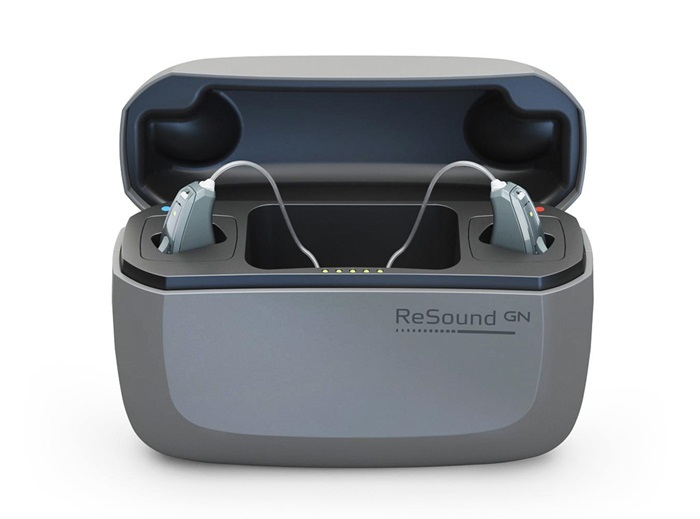 This rechargeable option replaces the initial rechargeable hearing aid battery technology (Nickel Metal Hydride). They are based on the type of batteries used in mobile phones and provide more staying power than Silver Zinc batteries. Not only do they have a longer battery life but they have a reduced charging time. Lithium-ion technology will outperform Silver Zinc in every categor – shorter charge time, longer charge in the battery before needing to recharge, and longer life-time of battery (4 years compared to 1 year). The major short-coming of Lithium-ion rechargeable batteries is that they cannot be inter-changed with a disposable battery as the Silver Zinc ones can. 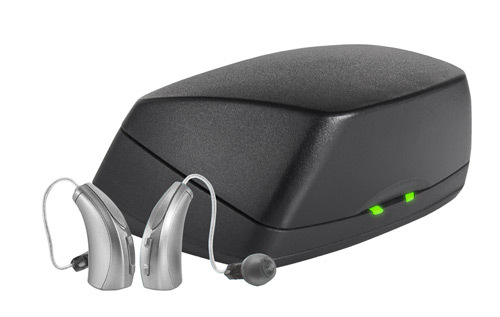 The hearing aid brands using the Lithium-ion option are Phonak, Signia, Starkey, ReSound and Hansaton. Released in 2016 this made for iPhone hearing aid (although you can purchase the Connect Clip for an Android phone to enable Bluetooth streaming) is compatible with the Z Power recharging kit for RITE and BTE models. With this hearing aid you will get 12 – 14 hours of charge if you utilise streaming, and up to 20 hours without streaming. 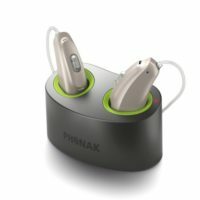 Released in 2018 and boasts the world’s smallest rechargeable hearing aid with the Moxi All model. The rechargeable battery will give you 30 hours charge, and allow you to stream from either iPhone or Android phones to one ear (battery life of 24 hours while streaming). Unitron rechargeable batteries need to be replaced every six months. Released in 2018 this hearing aid is reported as the longest lasting rechargeable battery. This is because the EVOKE has the lowest power consumption of any rechargeable hearing aid, even when streaming. 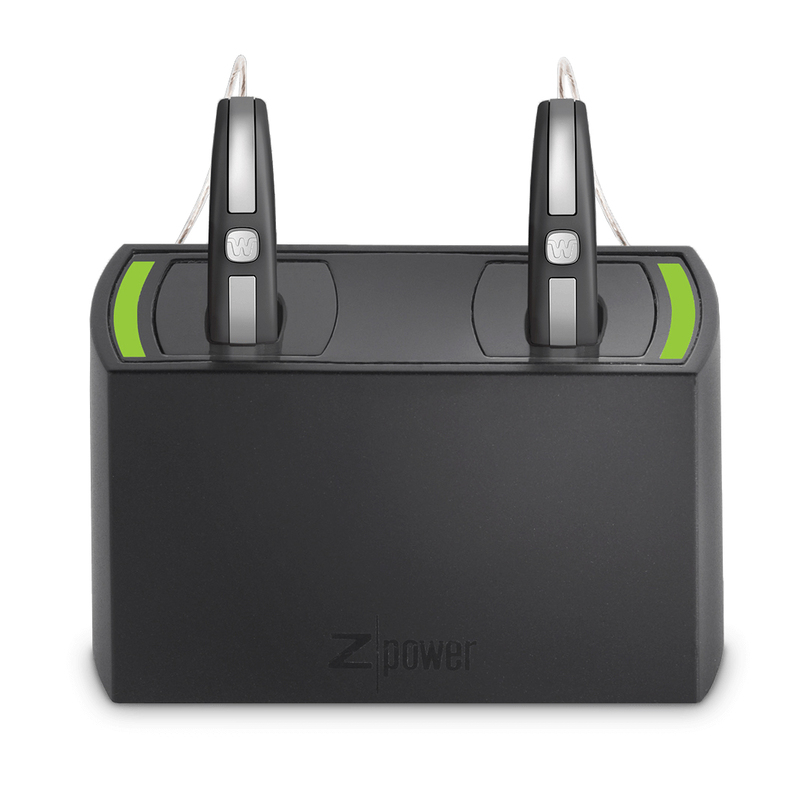 How to get the most out of your Z Power rechargeable hearing aids? Charge your hearing aids every night. Remember it takes up to 7 hours to get a full recharge. You’ll know it’s ready to use again, with full power, when the green indicator light is solid, not blinking. When you’re not using your hearing aids, put them back on the charger. Always keep some disposable batteries handy in case you forget to recharge overnight. If you remove the Z Power battery from your hearing aid don’t leave it near other metals as this can short-circuit the battery. Keep batteries and battery door clean with a soft cloth. You can use a rubbing alcohol when cleaning but don’t ever submerge in cleaning solution. Don’t be tempted to open and close the battery door to reboot the battery – some people do this to trick the circuitry into thinking a disposable battery has been inserted. Although your battery make work for a short time doing this can over-discharge the battery and eventually shorten the life expectancy of the Z Power battery. When you get the low battery warning either pop your hearing aids on the recharger or slot in a disposable battery until you can get to your recharger. If you see a red light on the charger, take your hearing aids out and check you haven’t got a disposable battery inserted. Quickly take the hearing aid off the charger and remove the disposable battery – now you can recharge your hearing aid safely. 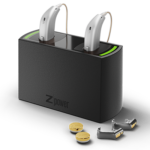 ZPower Rechargeable Hearing Aid System from Bridge Design on Vimeo. If your Z Power rechargeable battery is getting low on power you will hear the low battery warning in your ear (your Hearing Healthcare Professional will have gone through this in your fitting appointment). And don’t worry – you can’t over-charge your batteries if you leave them on the charger for over 7 hours, in fact, it’s best to leave the hearing aids on the charger when not being worn, EXCEPT if you won’t be using your hearing aids for over two weeks. If this is the case then remove the rechargeable batteries from your hearing aids and store them safely away from metal objects. Released in 2018 with rechargeable option for RIC models only. This hearing aid provides 30 hours of battery life without streaming with 24 hours available when streaming. Three hours of charging time will give you full battery life. The charging case is the smallest on the market. Once charged, the case itself will give you three full charges for both hearing aids, making it a portable charging case – no power outlet required. The case simple to use without having to struggle matching up charging points on the hearing aid. Released in 2017, Phonak rechargeable hearing aids have a power pack that will give you an additional seven charges, once the pack has been fully charged. You can also get a mini re-charger for use in other places – leave it at work if you forget to charge overnight. A 30 minute charge you’ll get 6 hours of battery life, 1 hour charge will get you 12 hours, 3 hours gets 24 hours charge. The battery in this hearing aid is lighter and more powerful than anything else on the market today. The Audeo B-R is a RIC style while the Bolero B-R is a BTE style hearing aid. Released in 2018, and provides 19 hrs per day if you’re not streaming and you get 17 hours charge with 5 hours of streaming. The new Signia Styletto also has the rechargeable battery option. 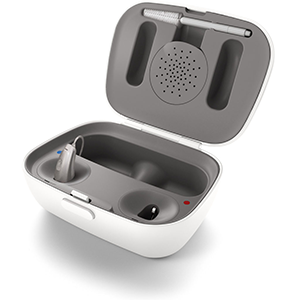 The charging case will give you 3 days of charge, without needing an outlet to power up your hearing aid. Both aids have the Signia OVP technology. Released in 2018 has a quick charge rate of 3.5 hours to give you a full 30 hours of power, even while steaming. The recharging case comes with a small moisture-removing brick and boasts three full re-charges once it is fully recharged. Your hearing aids will turn on immediately after removing them from case. Released in 2017, this RIC hearing aid will give you 24 hours of power after a three hour charge. It comes with the Comfort Charger case which has an optional desiccant capsule to keep your hearing aids dry. You can also get a Comfort Power Pack giving you up to 7 charges, without having to plug it in to a socket. 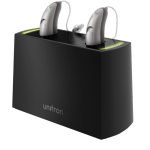 Where do I buy batteries for the Unitron Moxi? I have the gold rechargeable 312 batteries. I live in the USA. Hi Rich, check E-Bay or Amazon to purchase batteries in the united states at affordable prices.